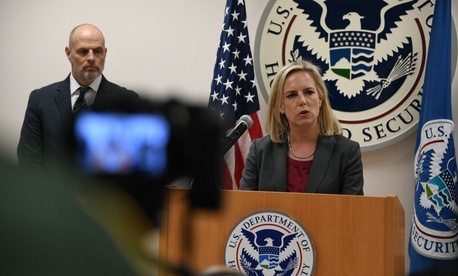 President Trump asked Homeland Security Secretary Kirstjen Nielsen to resign on Sunday and announced the departure of Secret Service Director Randolph “Tex” Alles on Monday. But the two high-profile removals are just a snapshot of much broader upheaval at the department. According to reports, L. Francis Cissna, head of U.S. Citizenship and Immigration Services, as well as John Mitnick, the department's general counsel, are on their way out. This adds to a list of acting or vacant top positions, such as FEMA administrator (Brock Long left in February) and Immigration and Customs Enforcement director (Trump withdrew his nominee, Ron Vitiello, late last week). With Trump naming acting Customs and Border Protection Commissioner Kevin McAleenan to serve as acting Homeland Security secretary, the CBP chief position is now open as well. The chart below shows the offices with vacant or acting leaders (red type), filled positions (blue background) and those for which leadership vacancies reportedly are imminent (yellow background). Click the image to enlarge it.